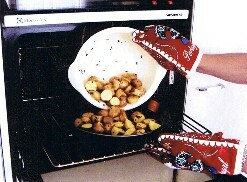 Preheat oven to 180° C and place in a roasting pan. Cut the unpeeled potatoes (any quantity) into bite-size pieces and rub them with olive oil and finely chopped rosemary, ground pepper and salt. 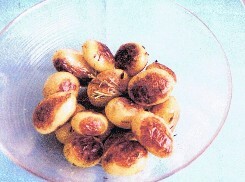 Toss them into hot roasting pan for 50 min. until golden brown turning them occasionally. 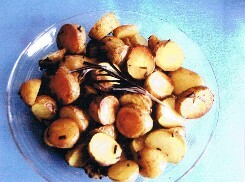 ► Tip: You can also use thyme and cook altogether with onion wedges and unpeeled garlic cloves.